"Just think about it. Our whole world is sitting there on a computer. It's in the computer, everything: your...your DMV records, your...your social security, your credit cards, your medical records. It's all right there. Everyone is stored in there. It's like this little electronic shadow on each and everyone of us, just...just begging for someone to screw with, and you know what? They've done it to me, and you know what? They're gonna do it to you." Angela Bennett (Bullock) is a bit of a shut in. She spends most of her time debugging programs for software companies and relying on her computer for her day to day activities. When a disk from a co-worker—whom she has never met—arrives, she is intrigued by the program's ability to access even the most secure Internet sites via a simple click of the mouse. Not surprisingly, the co-worker "knows too much" and, on a routine flight to meet Angela and discuss the disk, he dies in a mysterious plane crash. Angela is shaken, but considers this a coincidence, and continues with her plans to go to Mexico. While on vacation, she digs deeper into the mysterious disk and realizes that with this program anything is for the taking, including top secret government information. Enter Jack Devlin (North), a fellow computer user with whom Angela soon forms a bond. She thinks he likes her and he does, but he also wants to kill her. As it turns out, the disk that is in Angela's possession is what Devlin is after, since having it would allow his group of villains to have total access to everyone and everything. After Angela escapes Devlin, she flees back home to find her life is suddenly gone. She is given the identity of a convict and everyone around her starts to drop like flies. There is an interesting question at the center of Irwin Winkler's The Net: When does technology cross the line from being helpful and innocent to being destructive and dangerous? We surf the web daily, checking email, sports scores, the news and even the weather; for the most part, we are relatively unharmed by it. You can order a pizza, buy concert tickets, or even a human kidney (god bless Ebay) with the simplicity of clicking a link. But on the flipside there is danger on the Internet, like Angela's predicament, and screenwriters John Brancato and Michael Ferris focus largely on this aspect, never considering the positive elements. The groundwork for an interesting premise is there. With so much of her time spent on the computer, and only a small handful of friends and acquaintances that can identify her in real life, can she prove she ever existed? Unfortunately, though, the script fails to see this as the most interesting aspect of the story. Instead, we are treated to an extended chase sequence that seems to take up the entire third act and answer a very small number of questions raised earlier in the film. I enjoyed the way the script shows the dangers and downsides of a life spent reliant on technology, but it never seems to go full throttle into this opportunity. The writers are content with going the conventional route of showing Angela outsmart a giant corporation and save the day for humanity. In the end, The Net only serves as a clothesline to hang the standard thriller elements out on. 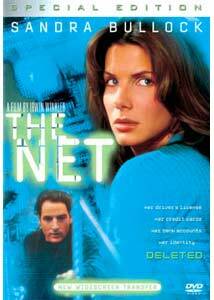 Despite these drawbacks, The Net continues to work because of the performance by Sandra Bullock, which she makes seem effortless. I like her low-key approach to the over-the-top material as she never falls into the trappings of the script and gives a terrific understated portrayal. This is main reason to stick with The Net through its problems. Northam, in his first American film, is also very good in the role of the central villain. He's slick, sometimes charming and this is perhaps the reason why his name has been bandied about as a possible future 007. Image Transfer Review: While the packaging boasts a "new widescreen transfer," from the look of this new 1.85:1 anamorphic widescreen transfer the original must have been pretty bad, considering this isn't exactly great. Edge enhancement is occasionally noticeable throughout, and softness is also a problem is in several daylight shots, particularly those on the beach in Mexico. Sharpness and detail, aside from the softness issues, are each nicely done, but it falls short of obtaining the film-like look that the best transfers often achieve. Print flaws are an occasional problem with scratches apparent on more than one occasion. Colors are rendered with vibrancy and no bleeding to be seen. This is a fine transfer, but the advertising led me to expect more. Audio Transfer Review: While not a bombastic mix, the Dolby Digital 5.1 track for The Net is certainly a bit better than I was hoping for. It is not showy, but the split surrounds are used effectively on several occasions, largely in scenes of a plane flying over or the ambient sounds later in the film that add to the thriller aspect of the movie. Dialogue is crisp and natural throughout, and Mark Isham's score sounds terrific across the left and right speakers. Extras Review: Originally released in the infancy of DVD as a bare bones disc, The Net now gets a second life on DVD, thanks to a new special edition release by Columbia TriStar. While I have no problem with dual releases as long as the new material is substantial and helps the film, I find it hard at times to recommend the purchase of a disc based solely on the supplements. With this new version of The Net, the abundant features look nice on the back of the packaging, but upon closer inspection there is less here than meets the eye. First are two newly-recorded, screen-specific commentary tracks by director Irwin Winkler and producer Rob Cowan, and screenwriter's John Brancato and Michael Ferris. The latter is undoubtedly the better of the two as it is by far the more entertaining and ultimately the more interesting. Brancato and Ferris discuss everything from the original aspects of the script as compared to the finished product and have a good laugh at some of the things they wanted, and got to do. One gag early on points out a Mel Brooks influence if only they could have pulled it off, while the obvious Hitchcock references are also discussed. There are large gaps of silence but none are too bad. The track by Winkler and Cowan is a bit drier in tone than that of the writers, as much of it is a discussion of what is happening on screen, but it is interesting nonetheless. There are some bits to be taken away from this track, including the possibility of Bill Gates playing a villain and the numerous Hitchcock references that are visible and not so visible. Next is a twenty-minute documentary entitled The Net: From Script to Screen that, while intriguing, given the subject matter turns out to be largely promotional. Ferris, Brancato, Winkler, and Cowan are each interviewed and speak about casting, the technological aspect of the story and keeping the information factual throughout. The worst thing about this documentary is that for a piece that shouldn't have been promotional it is, and that is too bad. The final extra feature of note is HBO First Look: Inside The Net, a less than inspired extended trailer for the film that offers nothing of any insight if you have listened to the commentary tracks or read the production notes. Interviews with the cast, as well as technical advisors pad the running time, but they aren't particularly interesting. Finally there are trailers for The Net, 28 Days, and The 13th Floor. Of the three, only the trailer for The Net is presented in anamorphic video. Filmographies for Winkler, Bullock, Miller, and Northam round out the extra features. Films about technology gone awry and Big Brother watching are certainly nothing new. Enemy of the State and The Conversation are perhaps two of the best examples of this sort of film done right. Those thrillers questioned everyone and everything and did it with paranoid brilliance, something sorely missing from The Net. Yeah, if Big Brother was watching, he'd have hit the stop button by now.